I needed a project to dabble and distract me in a constructive manner. 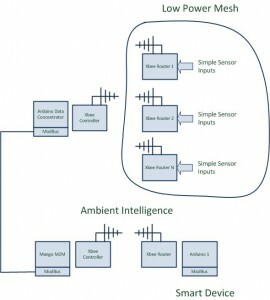 The goal for this project is to build a low power data collection network to sample slow changing analog data such as temperature, ambient lighting, among other things. The constraint given was to use XBee Series 2, run in API mode, and operate on batteries. I purchased 5 XBee Series 2s to experiment with. I used X-CTU software to configure the Xbee chips as per the last project I did. The difference this time is I did not want to use AT mode but API mode to give me more control over XBee interactions from the Arduino host software. The project context is as shown below.